With the holidays right around the corner if you're searching for that perfect gift for your husband or dad look no further the ultimate car and garage kit is a great gift for guys! Perfect for detailing your car, cleaning the garage or vacuuming up dust in the work shop the ultimate car and garage kit is designed to deliver optimal cleaning. Have you ever been plagued with the duty of cleaning up your garage or car and not have a handy cleaning device? Your problems are solved with this innovative solution. Designed with the garage in mind, the ultimate car and garage kit helps you organize your space and gives you all the tools you need to keep it clean. Available in 30 or 50 ft. length the ultimate car and garage kit allows you to reach into even the toughest spots. Each 30 ft. attachment set comes with Round dusting brush with tough extra-long nylon bristles. Upholstery tool, crevice tool, hose hanger & see-thru mesh caddy bag. The 50 ft. attachment set comes with round dusting brush with tough extra-long nylon bristles upholstery tool, slide on upholstery brush with tough nylon bristles, crevice tool, curved wand with cuff and full swivel, 2 18" molded straight wands, 14" extra-wide floor tool with long lasting natural bristles, & hose hanger see-thru mesh caddy bag. The ultimate car and garage kits come with a bright orange hose helps reduce the chance of identically damaging the hose. This utility attachment set makes the perfect gift for any man. For more information on car and garage kits, check out our site here. Sebo Felix Upright Vacuums - Does Your Wife Want Bling? This limited edition model is only available for a short time. Never a company has ever introduced such beauty and power all in one. The Swarovski Crystal SEBO Onyx is the perfect gift for the holidays. Engineered to be not only elegant but to operate with superior performance the Swarovski Crystal SEBO Onyx is by far a premium German built upright vacuum. What is it that makes this SEBO different from the SEBO Onyx? 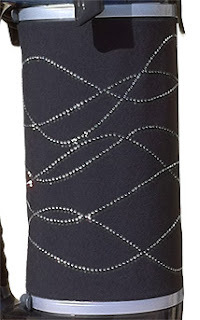 The SEBO Crytstal Onyx offers a stylish Textile Exhaust Filter with 100% genuine Swarovski Crystals. Super lightweight and maneuverable the SEBO Swarovski Crystal Felix Onyx allows for easy operation with its 180 degree steering ability and its low profile design enables you to get under and around things with ease. Its four level manual height adjustment helps the SEBO Crystal Onyx to contour to all types of carpeted surfaces. The SEBO Felix Crystal Onyx also comes with a parquet brush; this is perfectly designed for cleaning for bare floors. The Crystal SEBO Felix Onyx offers an integrated hose handle simply pull it out and use it to clean hard-to-reach corners, edges and crevices, with the included crevice nozzle and upholstery nozzle. For special tasks, attach other optional SEBO attachments. The SEBO Crystal Felix Onyx has an ET1 power head brush that offers a deep action clean by aggressively cleaning carpeting. For hard floors and extremely gentle rugs, you can turn the brush roller off by pressing the power switch/indicator on the top of the head. And you can remove, clean or change the brush roller with the press of a button. Behind the stylish surface of the Crystal SEBO Felix Onyx hides an ultra-modern S-class exhaust microfilter that not only provides excellent filtration, but it also absorbs motor noise, resulting in extremely quiet operation. For one time only Thinkvacuums.com is offering this Swarovski Crystal Textile Exhaust Filter for the SEBO Onyx a $110.00 value absolutely free with the purchase of the SEBO Onyx. We have only three in stock and this offer is valid while supplies last. Mention this blog to take advantage of the Swarovski Crystal SEBO give away. Call in to place the order and ask for Dan.